Standing in front of St. Paul's Church National Historic Site, you probably wouldn't guess that you were on the border of New York City. The setting is almost frozen in time. Here, listening to the wind sail through the trees on an early spring day, you can imagine the people and events that helped shape not only the local area, but American history, too. The cemetery at St. Paul's Church contains burials dating to 1704, making this one of the oldest continuously used burial grounds in the nation. It reveals a remarkable story of continuity and change in attitudes toward death over a period of 300 years. Visitors notice the varied imagery on headstones—eerie skulls, sweet cherub faces, and neo-classical designs. The ornamentation is dependent on when the stone was cut; earlier stones tend to depict symbols of death to remind the living of their mortality. Tastes shifted in the 1800s, when more comforting designs were adopted. The cemetery provides a great view of the church itself. Eagle-eyed visitors will notice a change in the stonework approximately halfway up the front of the church. 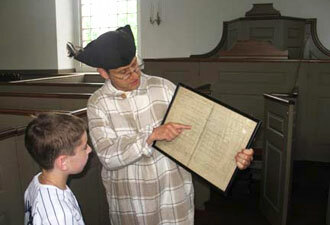 Church construction, which began in 1763, was interrupted by the Revolutionary War. 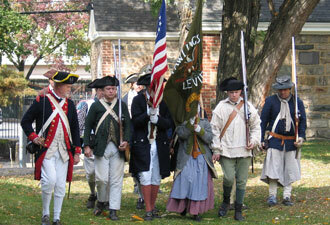 It was near St. Paul's Church that the famous Battle of Pell's Point took place. During the battle, a band of Massachusetts Continental Army soldiers, who were outnumbered five to one, held back the British-Hessian Army long enough for George Washington's troops to escape. St. Paul's also played a role in the in the development of religious freedom in America. Less than a year after the election of 1733, which took place on the church grounds, important legislation was passed allowing Quakers the right to affirm, rather than swear, the oaths required to vote in the colony’s elections. This seemingly minor change ensured every man's right to vote, no matter his religious beliefs. Inside the church, the lack of decoration on the walls, typical of Protestantism, makes the organ on the balcony seem even more extravagant and impressive. The organ was a gift from George Rapelje, who donated the necessary $800 in 1833 for its purchase. Today, when the organ is played, it fills the entire space with a rich, warm sound. Although the church offered its last service in 1977, it is still a gathering place for the community, sharing a wide variety of events such as living history, educational and children's programs. Walking tours of the site, encompassing an orientation, the museum exhibitions, the church and the cemetery, take place every week, at 10:30 am and 2:30 pm Mondays through Fridays. During spring and summer visitors can tour the tower to see one of the country's oldest church bells. The 250-year-old bell was cast at the same foundry as the Liberty Bell. 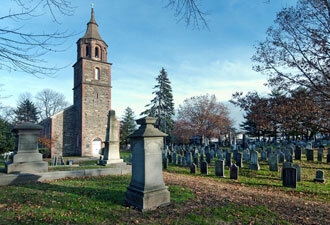 The St. Paul's congregation hid the bell during the Revolutionary War to save it from being melted down for bullets. While at St. Paul's, children can participate in our Junior Ranger program, and learn about the park's rich and fascinating history. Staff recommends you plan to stay for two hours in order to experience all the site has to offer. For more information, check out the video here!